This guide will help get you started. We'll take you through key steps, introduce you to important concept and point you to further documentation and other resources along the way. It's not intended to be a complete tutorial, and you will need to be prepared to look further into some topics on your own if necessary. A plain-text code editor to work on the code and configuration is required. Atom, Sublime and Visual Studio are all excellent choices. Django is a framework based on the popular programming language Python. If you are a complete beginner to Python, we recommend learning some basics (the Learn Python the Hard Way course is recommended). More information about your account, project settings and more. Additional detail about project creation options. You might find answers to your questions here. More experienced developers should be aware of the material in our Developer Handbook. Some of these guides will make more sense and be most useful once you have already dived in and are working with Divio Cloud. Then select a suitable subscription and create the project. By default, Divio Cloud installs the latest Long Term Release (LTS) version of Django. You can change this by navigating to the Addons section and selecting Aldryn Django. Additional information about changing the addon version is available in our support section. Understand the difference between the test and live server. Know what you can do with your project and its settings. Install and configure the Divio App for local development. This will take a few minutes to conclude. Once completed hit Start to launch your local server. Not working? Retrace your steps, and pay close attention to any error messages, as they will contain important information about the problem. You will also find valuable guidance in the material recommended above. Divio Cloud uses Docker to run your projects locally. This allows you to use any programming language – be it Python, Node or PHP – locally, without configuring your operating system to support it. If you are experience issues, have a look at our troubleshooting section or our Docker guide. You will need to run commands in a command line environment. The Divio App makes this easy for you - just click on the Divio Shell button on the lower left of the app. This will create a terminal shell with all the necessary environment variables in place. Everything should show up with green checks - if not trace your steps back to resolve it. You should be familiar with basic shell commands such as cd , open and cp as they are essential items in the developer's toolbox. The Learn Python the Hard Way tutorial has a very good appendix introducing these commands. Don't forget to cd to into the project folder first. You can upload and download files from your local server to the test server easily using the Divio App. Simply use the corresponding Download and Upload controls and select what you want to transfer from the menu. The Divio App automatically commits these changes into your Git repository. Divio provides a Git server as part of the service. Git is a version control system (VCS) and tracks the history of your changes as people and teams collaborate together on a project. It is very helpful to be familiar with Git and what it does. An excellent starting point is the very popular Git tutorial on GitHub. Now head over to the Django tutorial and start your journey as a Django developer. You can skip ahead to Writing your first Django app, part 1 - Creating the polls app. From there your journey to learning Django begins. You can still read the first two chapters until Creating the polls app. They help you to understand what's necessary to set up Django. However, there are no actions needed as Divio Cloud optimises the setup automatically for you. You might encounter a slightly different file structure from the Django tutorial. This is fine - many developers have their own preferred style. Our setup uses an opinionated structure set in Aldryn Django. We describe the differences in more detail in our developers section. It is sometimes required to restart the server after a change; you can do this through the Divio App by clicking on Stop/Start. 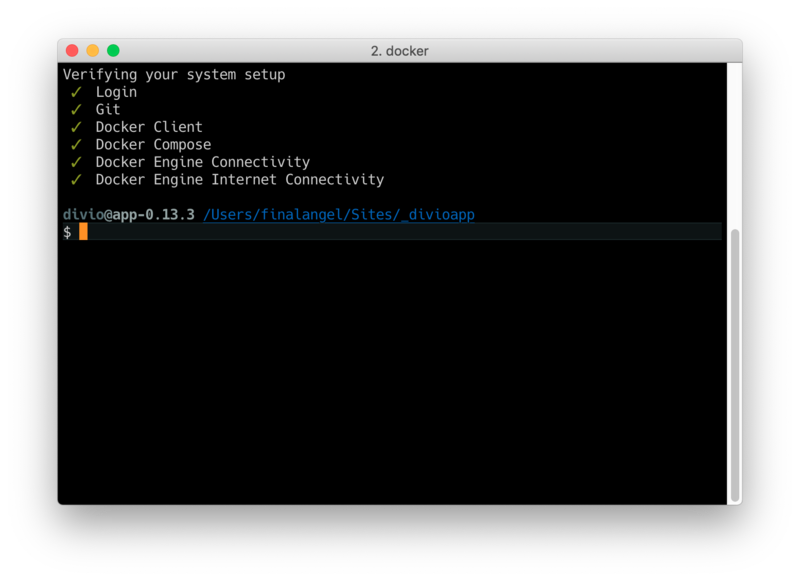 If the server still doesn't run try docker-compose logs to see what the issue is. It may be a simple typo or missing modules import. Instead of SQLite, Divio Cloud provides a Postgres database automatically for you. There's no additional configuration required.